HIGH NOON - GREAT iPod Touch / iPhone Game! .... you challenge players "on line" and one-on-one, in real time .... the duel is over in about 30 seconds but you have to "holster your iron" wait and draw on the church BELL .. while listening to the short "spaghetti western" type of background music! It would be great to challenge F1 Forum members and to see who is the "TOP GUN" in town (so to speak) -"if ya aint yella that is"
- common Dave and all you members that have iPhones / iPod touches, download the free App for some real fun! TRY IT - you can even "get" me ..... if ya good enough !! Your phone is your weapon as you duel with people around the world to become the most wanted outlaw on the planet! Duel with others in real-time. Win duels and collect reward money to customize your character. As you build your reputation, the bounty on your head will attract competition from around the globe! • Special equipment: dynamite, lassos, silver bullets, voodoo dolls... wooden teeth and more! • Western wear: greenhorn, gambler or disgruntled civil war soldier - you can customize your character from head to toe! 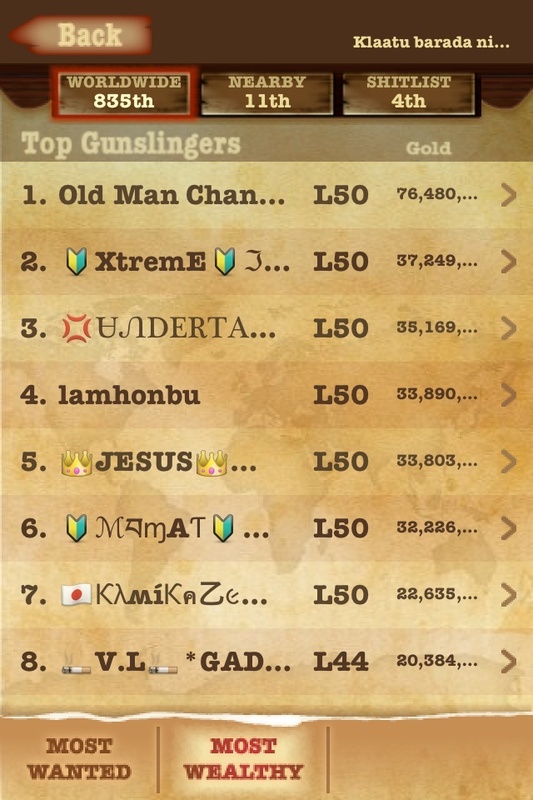 Re: HIGH NOON - GREAT iPod Touch / iPhone Game! haha but I am a droid user. If I didn't know it was you schuy I'd have thought this was a spam ad! My reactions are too slow for that kind of game. Now a game that involved shooting iPhones.... I would download that! Obviously, not too high up esterence !!! o really looking nice it's a iphone game and i am a big fan of games. Get into it samchn07A and welcome to this F1 Forum! ..... after about 7 months playing at least once a day, I'm on Level 37 with about 2,345,000 in Gold and have a reward on me of some 1,830 Gold! The highest Level one can reach at the moment is level 50. ..... there are over 4,500,000 players world wide. I'm only ranked at about 834. th most wealthy. The player with the highest Reward posted on their head is at about 3,917 Gold ... 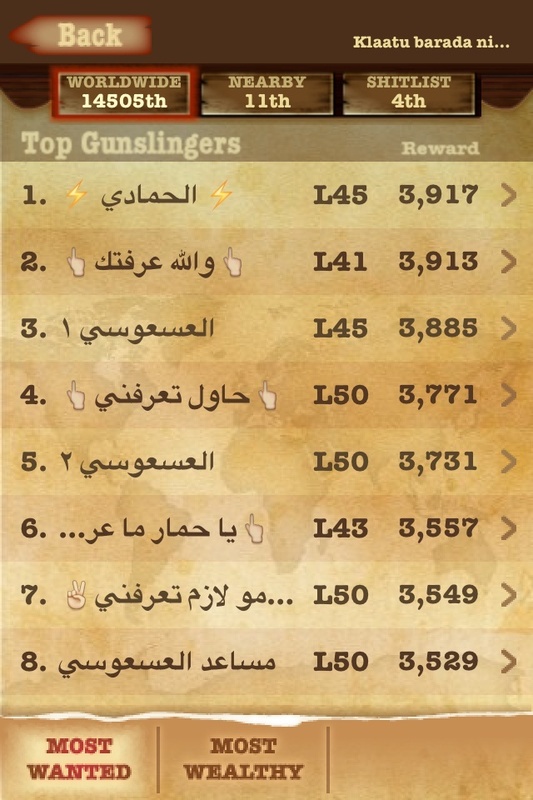 I find the Middle Eastern people REALLY like playing Gunslingers .... maybe someone could translate their names from Arabic? - the more showdowns you win, the higher the reward posted on you becomes. You play a showdown "one on one" in real time - it could be anyone in the world and takes only about 20 to 40 seconds ..... you can play up to 10 showdowns in a row if you want! Just a bit of 1870s Western fun ..... and a bit of escapism ! It's a fun game !! Searched for it on the Android Market and nothing turns up ( One single player western game did come up, but it was obviously something else ). Seems like this is an iOS exclusive. I have stopped using my Ipod Touch. High Noon pulls in some decent figures in terms of actives and revenue. The game has 250,000 daily active users and had its first $1 million month in July. ..... close to launching a version of the game that’s based on the Unity 3D gaming engine, which will also bring the title to Android. Then after that there will be more original games. I remember after my iPod drowned 7 months ago at the beach, I immediately bought a new one ..... just to keep playing High Noon !! - the good people at Happylatte even quickly transferred all my previous High Noon results to my new iPod 4G ....... I guess I must be addicted! Hehe. I'm looking forward to the Android version . How do you get them to transfer your account? I had an account with tonnes of things and I forgot the details. But I know everything on it and that. Welcome "byVeoh" ... nice of you to join this forum just because of a non F1 related game that I'm still addicted to! ..... I'm now on Level 48 and have 8,234,200 gold ... and still going! Anyway - to transfer my data / scores from my old iPod I just emailed the good people at HappyLatte and gave them my old HN game ID # and my new iPod ID # and they just transferred it all over in a couple of days. Easy. See ya 'round the Gulch ... if ya aint chicken! Sorry, but do you know the email anymore? And by ID, do you mean your high noon ID? byVeoh a écrit: Sorry, but do you know the email anymore? And by ID, do you mean your high noon ID? You can fill out the info below and e-mail support@happylatte.com to transfer over your account! With this info I can switch your character over. Wish you a wonderful day!